Many Industrial water purification technologies exist to produce purified water for manufacturing, commercial and industrial applications. Pure water that's often required for these processes, H2O, is colorless, tasteless and odorless. As water goes through earth, it becomes contaminated with substances, both beneficial and contaminants as water is a perfect solvent. Many of these substances need to be removed in order to produce water that's acceptable for industries. One of the major factors for the industries is control of corrosion and scale. 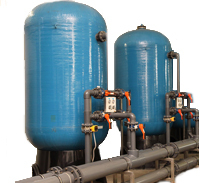 Visit Commercial Water Systems Case Studies page. Water impurities include dissolved and suspended solids. Calcium is one of the primary contaminants that's required removal. Turbidity, Hardness (calcium and magnesium as CaCO3), Alkalinity, Sulfate (SO42-), Chloride (Cl -), Nitrate (NO3-), Fluoride (F-), Sodium (Na+), Silica (SiO2), Iron (Fe2+ Fe3+,ferrous and ferric), Manganese (Mn2+), Aluminum (AI3+), Hydrogen Sulfide (H2S), Ammonia (NH3), Dissolved and Suspended Solids are all common contaminants found in various water sources. Different water purification methods exist to address these problems. Many industrial systems use Aeration and Clarification steps as a pre-treatment to reduce Carbon Dioxide, Ammonia, Hydrogen Sulfide and for Iron and Manganese oxidation. Coagulation and Flocculation are steps of water clarification. Next step is usually Filtration and/or Ion Exchange. Industrial Water Purification Systems below are designed for those steps. Next step may be Demineralization (DI) or Membrane Systems such as Industrial Reverse Osmosis Systems (RO) below. Depending on the applications, DI systems may come before or after the RO. For instance , to produce Ultrapure water for Laboratory use, a DI system is required after RO. For standard industrial water, where mineral content is high , DI may be used before RO.